End tab file folders are designed for efficient shelf filing with double-thick tabs for strength, embossed lines for easy label application and an undercut front panel for label readability. Ideal for medical, dental and hospital filing systems or any other large records management systems. Folders are slit-punched on 2-3/4" centers in positions 1, 2, 3 and 4 for customized fastener installation. Fasteners are sold separately. Tabs are 1/2" wide, 4" high and 1/8" up from the bottom. Front panel is 9-1/2" high and undercut 1/4" deep. 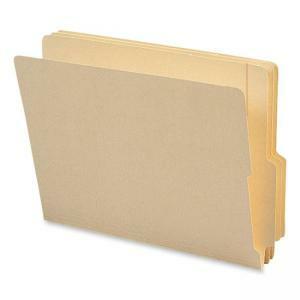 Folders are made of 11 point stock and scored for 3/4" expansion.